More big numbers for ESPN and the World Cup soccer. In a major game on Thursday between the U.S. and Germany -- in which Germany won 1-0 -- ESPN pulled in a Nielsen 10.7 million viewers -- the third-most-viewed men’s World Cup match ever on ESPN. These results, while strong, did not improve upon an earlier round match between the U.S. and Portugal, which took in 18.2 million viewers. U.S.’s first game of the World Cup against Ghana tallied 11.1 million viewers. ESPN’s World Cup opening round ratings for 48 World Cup matches averaged 3,540,000 viewers for ESPN, ESPN2 and ABC telecasts combined -- 46% higher than 2010 World Cup’s 2,429,000 and 109% higher than the 1,691,000 in 2006. Looking at its digital video results, viewers watching the U.S.-Germany game on the WatchESPN app had 3,200,000 unique viewers. ESPN says this accounted for a 10% to ESPN’s English-language TV audience. 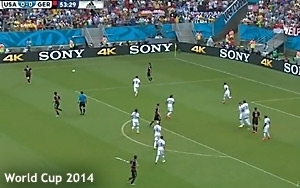 WatchESPN is averaging 737,000 unique viewers through 48 World Cup matches. Overall, ESPN said the U.S.-Germany game generated an average minute audience of more than 12 million people across TV, digital and audio platforms.